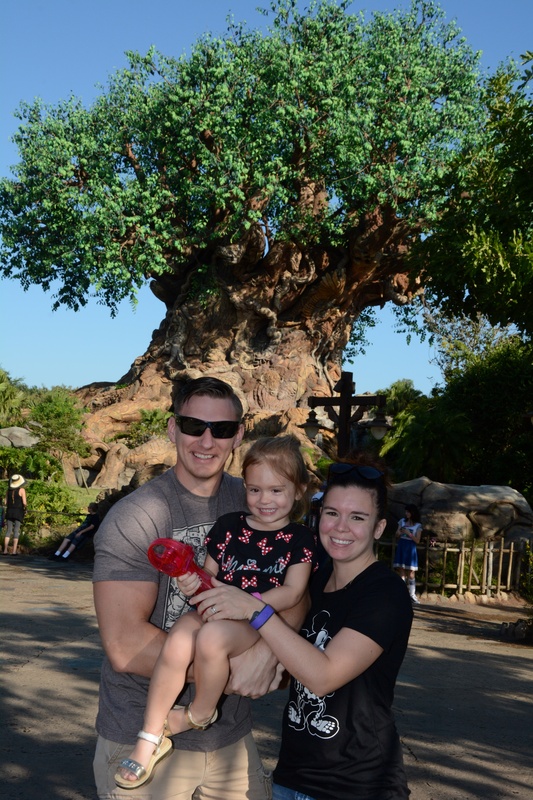 Day three of our Walt Disney World vacation was Animal Kingdom. 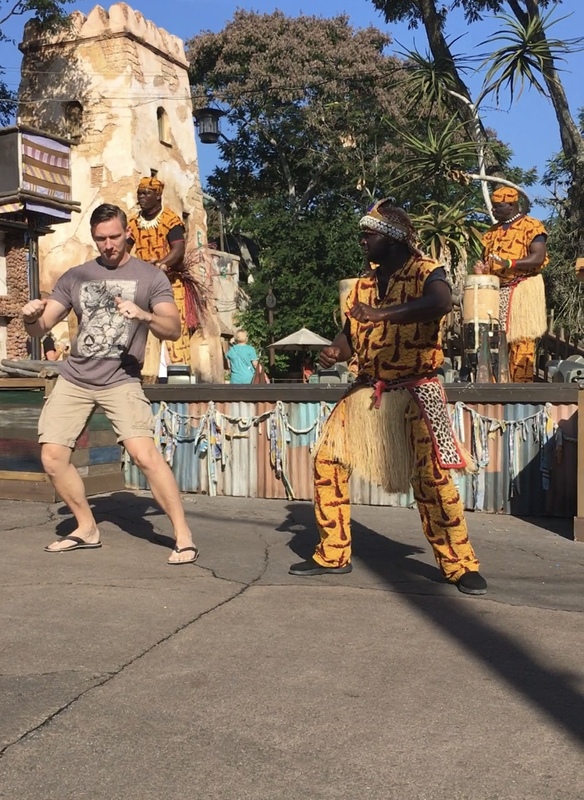 Within 10 minutes of us entering the park, my husband was recruited into an African dance performance. Because that’s how we roll. And I have to say, he did pretty well! In fact, I think the cast member was a little shocked that a 6’3″ white guy could keep up with him in the booty shaking department. I’m not allowed to post the video, because my husband would just die. But I’ll gladly show anyone who asks, because it’s AMAZING. I had made a FastPass+ reservation first thing for Kilimanjaro Safari. The animals are most active in the morning, so I wanted to be sure we got to see as much as possible. 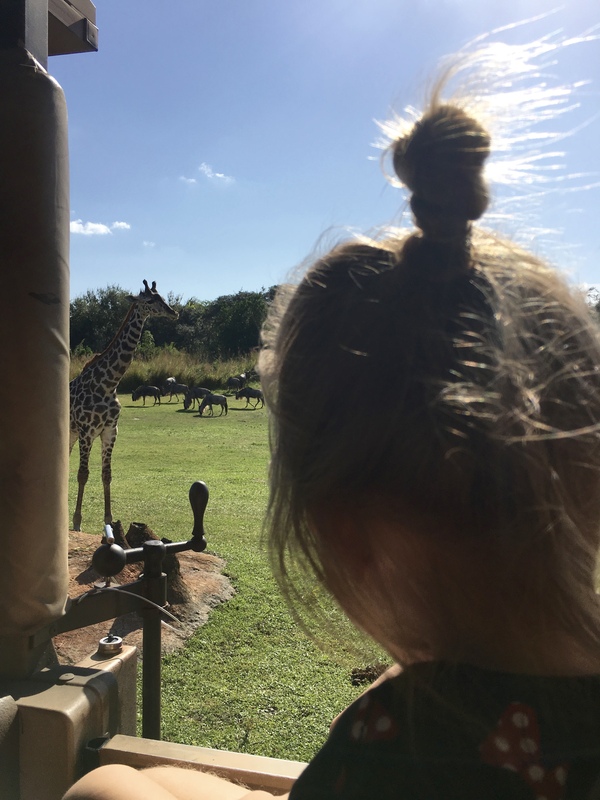 Dorothy wanted nothing more than to see a giraffe, and luckily there were plenty of them close to our safari truck for her to look at. Now she legit is asking for “a real giraffe” for Christmas. I can’t make that up. After we got off the safari, it was nearly time for lunch. 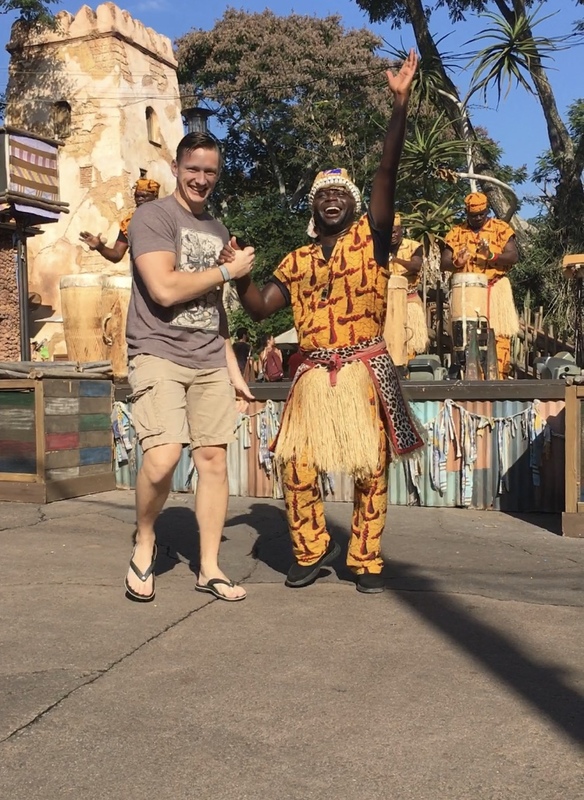 We wondered around Africa (which is amazingly themed), and did a little shopping. I wanted so many things… yet I only left with a Minnie Mouse sweater. But, while daddy was in the bathroom, Dorothy and I managed to buy a giant plastic tarantula. She named him Fred. The thing was freaky as hell. And, luckily, I don’t think it made it back to Indiana with us. I had a lunch reservation at Yak & Yeti. I just had a beer and an appetizer of steamed pork pot stickers – which entirely hit the spot. While we didn’t notice anything super special about that restaurant, it was a nice little sit-down lunch for us. Following lunch, Dorothy wanted to ride Kilimanjaro Safari again. Giraffes are her jam, obviously. So, with only a 20 minute wait, we did. That’s the beauty of WDW in the fall – you can just jump on almost whatever ride you want! Our next FP+ was for the Festival of the Lion King. Courtny and I had seen the show before, but it was entirely worth it to get a FP+. We got to enter the theater before the regular line, and Dorothy was amazed by the whole thing. 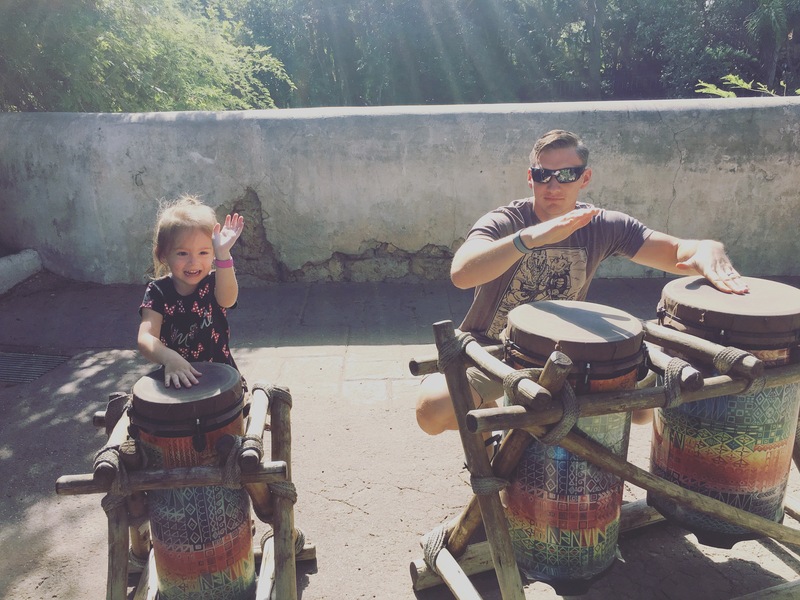 Our seating section was designated the “elephants,” and I swear she still asks us to make elephant noises at least twice a day. 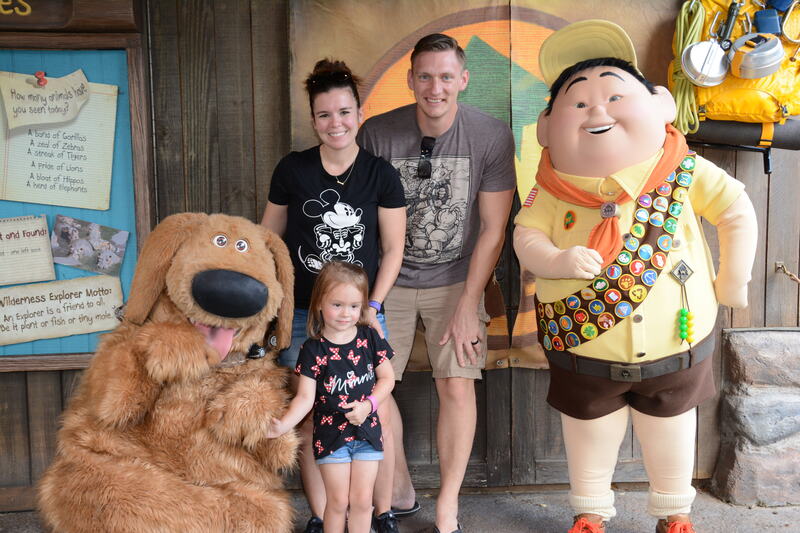 We decided to leave the park after the performance, but not before we met Russell and Dug from UP! 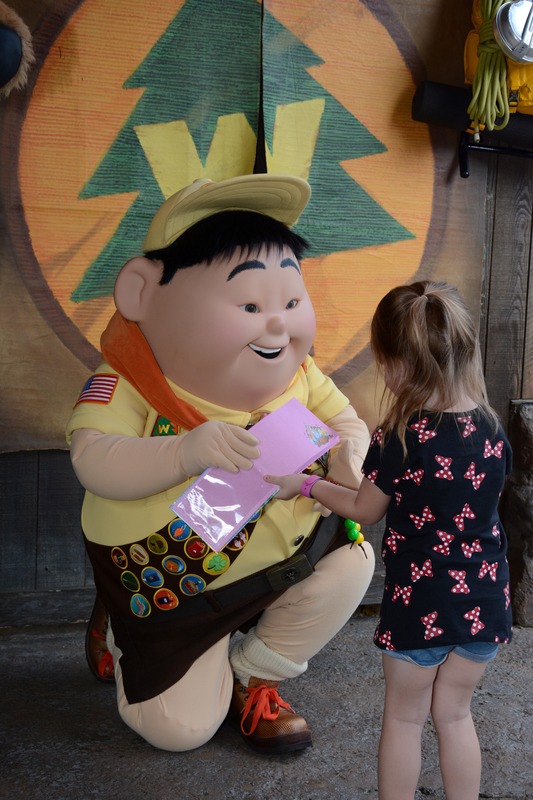 The wilderness must be explored! KAKAW-RAWR! Of course, after we had left security for the buses, my toddler had to go potty. Which required us to go BACK through security so she could pee. Mom life with a two-year-old. Courtny split from us at that point, and headed to the TTC to look for his lost iPhone (which was not found). Dorothy and I headed back to our room to rest with Fred the spider and a relaxing view of the lake. We headed to the Magic Kingdom that evening to eat dinner and watch the fireworks. Since Mickey’s Not So Scary Halloween Party was happening during our stay, this night was the only one we could possibly see the fireworks over Cinderella’s Castle without attending the party. 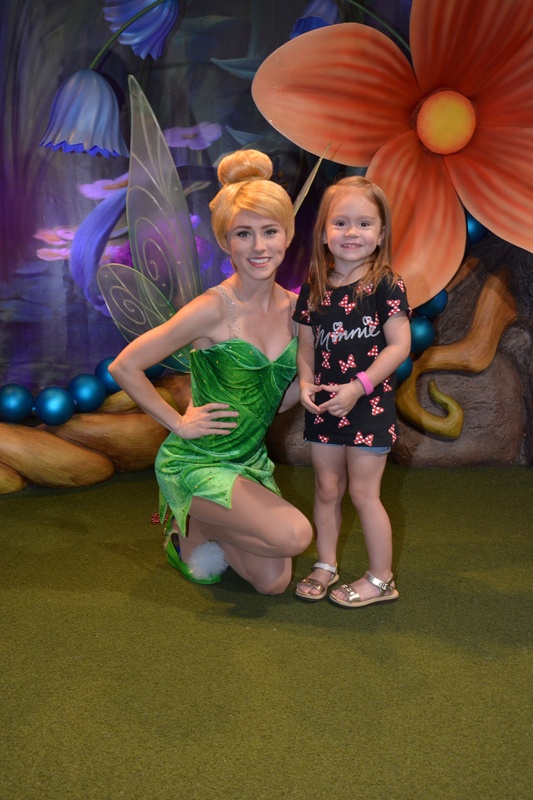 As soon as we walked in, a cast member greeted us and gave us FP+ tickets to meet Tinkerbell. Just because! So nice! I had made dinner reservations at Tony’s Town Square (which, is highly over-rated. Do not recommend. ), with the intention of finding easy seating afterward for the Electrical Parade and fireworks. But, a few weeks before our trip, Disney ended the parade permanently – total bummer. So we snagged a giant lollipop and some sugar cookies on Main Street USA, and hopped on the bus to Saratoga Springs. Happy, happy. Except, that’s where our entire night went wrong. When we got off at our bus stop, and entered our section of hotel rooms, I could sense something was wrong. There were towels at the base of all the doors in our hallway. “It looks like there was a flood or something.” – Me. Oh, guess what? There was a flood. A massive one. Conveniently, it was centrally located… in our room. We were met by a man in our hotel room. It turns out, the room above ours had a washing machine that malfunctioned and flooded down into our room. I’m talking 2 inches of standing water, with rain coming down from the ceiling, at 10 p.m…. with an exhausted two-year-old sucking a lollipop as big as her face in her stroller. At least she was happy. Long story short, we had to gather all of our belongings and re-pack. Nothing of ours was damaged – just some wet clothes. We met with a manager, who happened to be from Bloomington, Ind., and we hit it off. He got us a new room, a golf cart transport, and $250 in hotel credit to cover our inconvenience. So, really, it wasn’t a half bad experience. Until we got to our new room, a full .5 mile from our old room, and the Magic Band reader was dead. So, at almost 11 p.m., the poor valet driver had to run and get a “hard key” to get us into our room so we could put our toddler to bed. At nearly midnight, the maintenance people were trying to fix our door… unsuccessfully, I should add… from the inside of the room. Needless to say, we were exhausted, and we needed adult beverages. And we should have just stayed in the Magic Kingdom because an over-tired kid at fireworks is much more magical than an over-tired kid in a flood. Oof. Stay tuned! Tomorrow we meet Elsa, eat dinner with the princesses, and ride the new Frozen Ever After in Norway. If you’re a Disney nerd like me, you’ll want to see this. 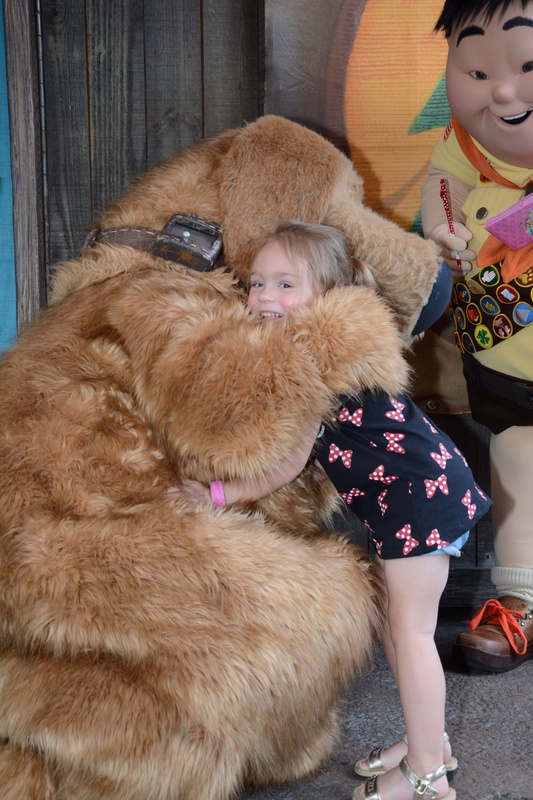 We are planning our first trip to WDW as a family for February and I can’t wait. Love following along.